ETMONEY is India’s largest financial services app that is simplifying the financial journey of new age Indians. 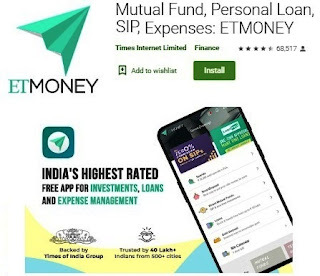 Available on Android & iOS, ETMONEY app to manage all aspects of their money automatically, invest in zero commission direct mutual funds of 25+ mutual fund companies for free & take loans starting from Rs.3,000 upto Rs.20 Lakhs in a paperless manner. The ETMONEY user’s financial journey starts with an AI-based money manager that helps users to stay on top of their spends, bills, investments, insurance & more without a single manual input. Next step of the journey, users can grow their money by investing in direct MF plans. This can help users save lakhs of rupees in commissions over long term. Within 18 months of launch, this innovative offering has made ETMONEY the market leader in online mutual fund investing. If falling short of money, user can avail ETMONEY’s LoanPass. Once approved, they can transfer money instantly into their bank accounts! Loans as small as Rs.3,000 can be taken instantly without recurring paperwork. Users have the flexibility to repay within a month & there is no prepayment penalty on these loans. This innovative offering has made ETMONEY the fastest growing lending app in the country. ETMONEY is transparent, free, instantly available & involves no physical paperwork - the way it should be in today’s world. ETMONEY app has 100% paperless solutions to all your financial needs like Expense Tracking, Money Management, Mutual Fund Investments & SIPs, Tax Saving, Instant Personal Loans up to ₹20 lakh starting at 11.99% pa, with repayment tenures of 2 to 5 years in one single app. Track your spends automatically categorized into categories like dining, travel & shopping. View all your bills like utility & credit card bills in one place & never miss a bill payment again. Explore mutual funds based on ValueResearch Rating & past performance. Check all mutual fund schemes, investment portfolio & performance based on past returns calculator. Save up to ₹46,800 per year in tax with ELSS mutual funds& get higher returns than other tax saving options like PPF & Fixed Deposits with shortest lock in period of 3 years. Set up SIPs in top ELSS Mutual fund schemes once & meet your tax saving goals every year. Earn up to 1% extra return on your SIP investments with India’s leading fund houses like SBI Mutual Fund, ICICI Prudential Mutual Fund, HDFC mutual funds, Birla Sun Life Mutual Fund, Reliance Mutual Fund etc. Create your investment account in minutes & start investing instantly via mutual funds & SIP. Explore & find top mutual funds for SIP or Lumpsum investment across : Large Cap Mutual Fund, Mid Cap Mutual Fund, Multi Cap Mutual Fund, Small Cap Mutual Fund, Equity Mutual Fund, Debt Mutual Fund etc. Get Personal Loan Up To ₹20 Lakh From Interest Rate As Low Ss 11.99% P.A. ETMONEY personal loan is the easiest way to take instant personal loans of up to ₹20 lakh. ETMONEY personal loan disburses paperless loans online in 950+ cities. Put your basic details & know your loan amount, loan interest rate & EMIs in minutes. Get your pass for instant loan or credit or LoanPass once& use it for emergency cash of ₹3,000 - ₹5 lakh from interest rate starts from 13% - 18% p.a. & repay in flexible tenures of 2 - 36 months. Pay interest only on the borrowed amount & processing fee of ₹100 or 2% of the loan amount, whichever is higher. Get your loan limit approval instantly by completing paperless CIBIL check. Get personal loans from ETMONEY to use it as instant loan like salary advance loan, medical loan, travel loan, marriage loan, 2 wheeler loan, wedding loan, commercial loan, car loan etc. From mutual fund SIP investment & tax saving with ELSS mutual funds investment to making instant personal loans, ETMONEY is the app for all your finance needs.